Rose Cottage01263 715779work01603 870304fax Self-cateringRose Cottage, a period cottage, is situated on the village green opposite the church in Heacham, famous for Norfolk Lavender with its range of lavender products. This location is an ideal place from which to explore the coastal towns with their shops, pubs and restaurants as well as the lovely countryside and numerous nature reserves of North West Norfolk. The chocolate-box exterior of Rose Cottage. 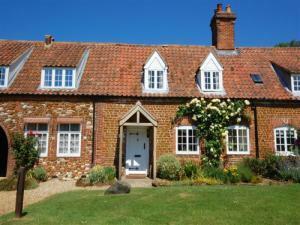 Rose Cottage, a period cottage, is situated on the village green opposite the church in Heacham, famous for Norfolk Lavender with its range of lavender products. This location is an ideal place from which to explore the coastal towns with their shops, pubs and restaurants as well as the lovely countryside and numerous nature reserves of North West Norfolk.